In every generation, there is a legend. A tale of heroism, a saga of triumph, or an era of sacrifice. When one door closes, another opens, for every ending has a bolder beginning. After making the agonizing decision to destroy the Relic that they carried across Tamriel, the Circle of Avathol have embarked on yet another odyssey. Guided by the stars and fuelled by the memories of the fallen, their purpose is each other and that which stands in their way. Yet this time, their cause is not a devotion to a single entity, but to root out corruption in a world that has been ravaged by chaos. From magic to metal, the wheel of misfortune and villainy seeks to annihilate everything that it touches, from the impoverished to the bountiful. So, what say you? One stage of the journey is over, and another begins. The road ahead shall be long and arduous, but the Circle always yearns for valiant companions. Both the spirit of adventure and the promise of dawn are pledges that we make, but in a world wrought with danger and turmoil, destiny often demands the greatest of sacrifices. Look now, and know that once your feet have been bound to the path ahead, the here and now will be long behind us and never shall we walk this way the same. In every generation, there is a legend. Will you add to the pages of our legacy? The Circle of Avathol follows the epic journey of sworn companions set upon often seemingly hopeless quests in an intense, fast-paced adventure, promising a rich diversity of themes, rugged experiences and moral challenges. The Circle must act to secure footholds in unfamiliar lands across Tamriel, where every action has the potential for great consequence upon their gruelling and perilous expedition. Under the mystic guidance of a mysterious Altmer seeress, the Circle serves faithfully in pursuing her visions, bravely venturing into untold danger and frequently met with strange happenings, as they endeavour to circumvent foreseen disasters and the cruel hand of a twisted fate. Be it a cultist seeking the path of redemption, valiant knight pursuant of fitting adversary, or even an opportunistic thief looking to exploit current company for their own selfish means, each have their own reasons to belong. From quaint campfire scenes to great schemes full of intrigue, we offer several events per week and open opportunity for keen DM's within the membership to not only engage with, but directly shape the ongoings around the Circle. 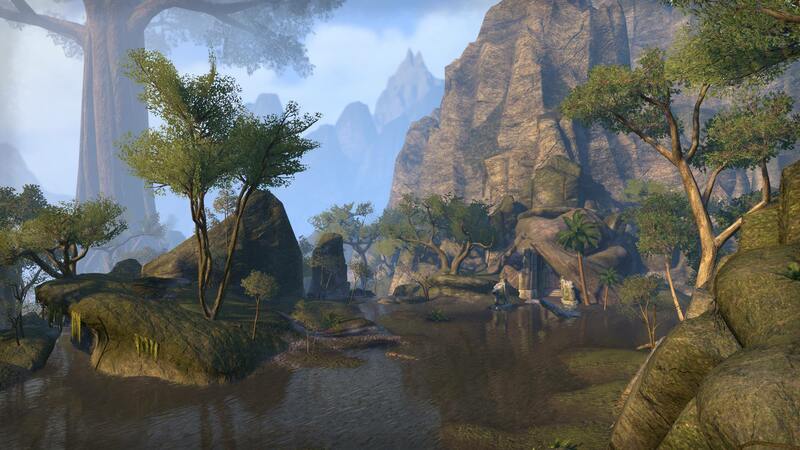 Each month, we aim to move to a different map following along on a course set by each chapter of our story, ensuring a frequent change of scenery, as well as travel upon the open roads of Tamriel with plenty of fun and meaningful social RP in between events. Largely democratic in nature, the Circle promises enticing character development and avenues for every member to shine and make their mark, as each individual that joins our union of misfitted companions, we believe has a unique role to play. All races and classes are accepted in the guild. However, we are quite selective on the characters that we will accept, based upon their suitability to our themes and their motives for joining. We expect new members to be active players with a strong grasp of English, and knowledge of basic RP technique and etiquette comes as a minimum expectation. We ask that applicants provide us with a single paragraph description of their character; referencing their personality, skills and relevant backstory. Once officers provide approval, In Character recruitment can then be arranged. For any enquiries related to the guild or to make arrangements for an interview, please get in touch with one of our officers, either in-game or through Discord. After rising through the ranks as a Ranger within the Ebonheart Pact, Bjorvik eventually came to the end of his time in the military and settled upon Bleakrock Isle with his beloved wife. Months later, displaced and at a loss, he took his mourning into isolation and survived due to his military experience and natural prowess in combat. Wandering the world alone for nearly four years, his frame and stature gave a huge advantage in being able to conquer the wilds and fend off any danger. For this man, companionship was a rarity and thus when presented with the opportunity to join the Circle, he was more than hesitant. From a glance, most would consider Elyse to be a nobody and quite honestly, they'd be right. Despite coming from a background of poverty and deprivation, following the loss of her parents at a young age, the redhead takes it in her stride as she seeks to find her way through the multiple twists and turns thrown her way in life. Elyse holds a high interest in enchanting, having 'found' a book in her early teens along with a minor set of cooking skills, picked up through her punishments for her minor misdeeds whilst growing up at an orphanage. Undeterred by her appearance and apparent lack of intelligence, she maintains a good heart and is one of the first to stand up to the authorities, believing them to do nothing but bring pain and misery to those less fortunate. Following a short string of rejections from various Mages Guild chapters within High Rock, the redhead was set to continue upon the same path were it not for a kind soul that happened upon her, promising her a fresh start, one that deep down, she knew she had to take, despite her pride. With the risks made clear and knowing she'd have to prove herself to be counted, Elyse took her first steps upon her new path, as a member of the Circle. Originally from the Ashlands of Vvardenfell, Nibani left the nomadic lifestyle of her tribe behind before she had even reached adulthood. Having to support herself through various odd jobs and even petty thievery, Nibani was quick to learn such skills as self-reliance, improvisation and risk-taking. These difficult first steps on the path of her life helped forge her social and conversational skills, though her volatile personality makes it difficult to truly earn her trust. Using her brazen skills as a pyromancer, Nibani helped the Circle win a hard-earned victory in their Avathol campaign. Over the course of this adventure, Nibani transformed into a battle-hardened veteran not averse to bouts of cynicism, yet she also developed a sentimental affection towards some of her comrades. She is now determined to stand by her friends as new threats loom on the horizon. From diving into dangerous dungeons filled with the living and the dead alike to simply standing in front of a door, no job is out of consideration for Bone-Scales. Travelling across Tamriel, he would lend his blade to no cause but the coin, taking any job to put food in his belly and a roof over his head at night. But alas, he seeks that which he has been deprived all his life; companionship, a sense of belonging. Armed with an assortment of potions and poisons and garbed in fine Argonian craftsmanship, Bone-Scales makes for a fearsome companion and a viciously loyal ally to The Circle. A lover of epic tales of yore in a society with eyes only for the present, it did not take An-Alum long to realise she was not quite at home in her little tribal village of Black Marsh. Having therefore set out on an adventurous journey in which friends and foes alike were made, the young argonian has learnt the ways of the warrior, purportedly having even earned the title of knight. 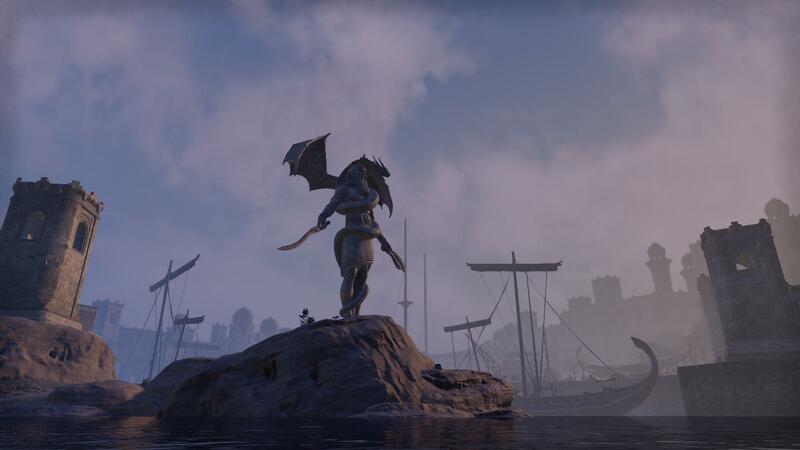 Following a series of unfortunate events, the 'Knight of Scales' found herself by her lonesome on the Isle of Auridon, where she got involved with the Circle of Avathol. Though having participated in their failed quest to see the Relic safe-guarded, the Argonian's lust for adventure has yet to be sated, and she looks eagerly now to what the future may bring. As a Bretic mongrel of Aldmeri blood, Rhaemoth's life has not been without its difficulties in the highest bracket of the Covenant's hierarchical society. With a mystifying mastery of the School of Alteration, and an analytical eye for the rationality of life, Rhaemoth's talents are exemplary to the naked eye. 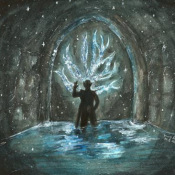 Having adventured through most of northern Tamriel, seeking for the answer that most have forsaken, he sees it as his life goal to unravel the truth behind the great vanishing of the Dwemer. Yet, for all of this knowledge and scientific passion, Rhaemoth is regularly hindered by his inability to maintain and control his emotions in the same vein as his incantations. However, with the Circle of Avathol's cause veering eternally towards the stewardship of Magicka, his talents have caught the attention of the Guardians, but will they be able to control such a divisive figure who walks upon the line of reason and instability? A man often shrouded by rumour, past mistakes and questionable moral standing, Relnold Ashencel is a man who is complicated at the very core of his being. A man who came into High Rocks public eye as a favourite spice trader among the nobility, and has resurfaced among many crowds, and many professions; mercenary, business mogul, masseuse and even a rumoured crime lord, he is scarcely known as a man easily categorised. Known among friends and enemies alike as the scoundrel with the sharp tongue and even sharper scimitar, he almost always wears a rougish grin and a swagger, and commits his varied deeds with no as much as a thought to consequence. However, those who have known the man can attest to a deeper, darker side, which is best left sealed by the smile and the rum. Relnold is a man who has more often than that been labelled hundreds of words, but the world simple is scarce among them. This sly Khajiit would do just about anything for gold! Eluzard may distrust many people due to his time spent alone, but his experience from all of his thievery has granted him the ability to stay hidden and watch with great ease. Eluzard is able to evaluate people from a-far, slowly gathering valuable information on a person before he may approach them. A dangerous past has equipped him with the perfect toolset for dispatching his enemies quickly and quietly. His weeks spent torturing has given him knowledge of the body's weak points, meaning should he face a larger and more powerful enemy he can dispatch of them with ease. Blessed with the Khajit's natural agility and capable of using his bare hands and claws during combat, his style means he can throw an attacking enemy off balance in order to create an opening for a quick and precise slice with his daggers. With such skills, he has grown self-sufficient over time and has been able to live off the land, choosing to avoid towns as best he can. Growing up as a street urchin in Senchal, R'aiq has been involved in many illegal ventures. Joining up with a pirate crew in his young age proved useful as he learned how to fight and use a sword. After he left his crew, he became a proficient thief for many years until he was betrayed by his colleagues and captured in a set-up. 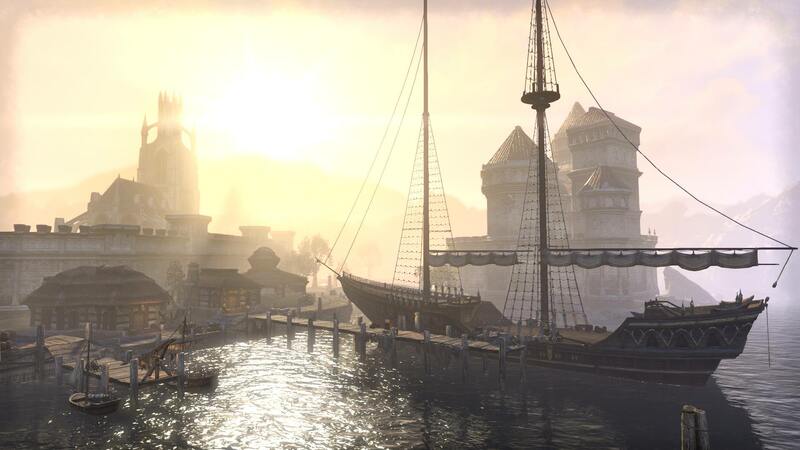 After serving his time, he decided to leave his old life behind, retire to Summerset, and become a merchant instead. But it did not last long, as he was betrayed yet again when it turned out the merchant company he was affiliated with were having illegal dealing with Pyandonea. Reported by his wife to the authorities for his "treachery", he escaped the Isles with nothing but the clothes on his back. What used to be a dashing and cheery rogue is now an old and cynical Khajiit. But will he find a new purpose and companionship with the Circle? Or will he be crushed beneath the weight of his past sins, and the wounds of betrayal? The son of a wealthy wine merchant and a caravan guardswoman, Leopold was fortunate for the wealth of his family in early youth, and he continues to hold a taste for the finer things in life, paired with an unyielding, steadfast resolve of ambition. He spent a lot of his early teen years taking part in the buisness that his parents had built, serving as a guardsmen himself. Though later he increasingly became more unhappy with his life, and decided to leave the comfortable life behind him. Setting out to join a mercenary company, he refined his swordsmanship and truly developed a lust for adventure. With a desire to aid along his travels, this hedge knight is always looking for daring quests that might occupy his attention. Mysterious. Unsociable. Aloof. These are words one might associate with Valethil on first glance, garbed in muddy leather, chainmail and a strange, masked hood. These are also incorrect words. Despite her apparent secretive nature, Valethil is a personable and largely cheerful individual despite the weights her unspoken past has laid on her elven shoulders. Seemingly optimistic to a fault, the Bosmer nonetheless knows when her quick wit and sharp tongue need staying, especially when her bow can do the talking for her. What potentially chequered past has given Valethil her smorgasbord of skills remains to be seen, or spoken of, but one thing is certainly clear in her mind: she must steel her shoulders, lest the burden – and ghosts – of her past crush her under their heft. Fairly young, woefully uneducated, Shara hails from the wilds of the Valenwood, as a Wood Orc of Clan Narzul. Her life amongst the clan was not an easy one. Often sheltered and held back from the expected duties of her clan by her chief, she was shunned, mocked and mostly hated, believed to have an easy, pampered life, and lacking in that which made an Orc an Orc in the eyes of her people. Yet the truth was much more terrible. The same truth saw Shara flee eventually. She ran and ran... not knowing how long for. She kept running until she was certain that life was behind her, and her new life was in her hands alone. A passable archer and warrior, the woman began to spend much time in the wilds of High Rock, hunting game and making a humble living off of selling their pelts. Before long, she found herself drawn to the intrigue and luxury of the cities, and whilst the wilds hold her heart, the cities held her tummy. Discovering the wonders of drink, sweets and bakeries the Orc began to frequent taverns and markets, and the city gossip and high tales told by the people slowly began to peak her interest. Tales of gold, treasures, feasts and adventures... And so she began to be a part of her own tales... and one such led her to meet the very heroes of the Circle. Surgeon Favarth can be regarded as a strange sight at first. If one can get past the human’s pale features, skinny frame, dark attire, and black humor, they will find that all these mold an intelligent individual, one who craves to further the knowledge of physicianship with his research. He stares at others in sharp, though attentive ways through his working eye, since the other tells the tale of a violent loss of sight; now a glass replacement resting between scars. His mannerisms are professional and contained, though he does not refrain from a sharp comment at the presence of neglect, or repetitive stupidity. Due to a troubled family life, he forms attachments cautiously, discreetly, though loyally. Having served the Pact for several years as an army doctor, and due to his knowledge of anatomy, he is capable of defending himself in a fighting situation. He is often seen as aloof, and receives many nicknames, though continues saving lives and researching with the same confidence. His words are pronounced with a nordic accent. No mere wizard or witch can both possess knowledge and wield it against the forces of evil. The art of protection is a dance, the experience of magic is a gift, and both cannot be taken lightly by the common man. Plagued by the ashes of history, and conflicted under the weight of dawn's dreams and dusk's dread, the strain of authority has never faded away. Firm but fair in every endeavour, Gilduin is the forefront of leadership against their enemies and the beacon of hope in times of strife. Whilst many can step up and claim the mantle, the ability to maintain the resolve that leadership's taint so often seeks to upheave, that is another gift entirely. To protect Avathol is an act of sacrifice, his twisted and contorted scars serving as an eternal reminder of Magicka's great consequence. Yet, to what extent can this Guardian of Avathol possibly remain pure, as an advocate of Balance can never result in moral absolutism? Having escaped the oppressive nature of Orc-kind's stronghold culture, and spent much of her life wandering the world as a mercenary soldier, Tura now serves the Hand of Trinimac, an order of priests dedicated to the Warrior God. Questing for the shards of Penitent, and seeking a way to restore that legendary weapon, the warrior-priestess has found herself in the midst of the Circle of Avathol, believing the restorative properties of the Relic they possess to be exactly what she has sought after. A former Companion of the Rift and thereafter a merchant guard of High Rock, this Skyrim raised man of Nord and Breton blood now seeks meaningful work of the kind that might make for good tale-telling, or more importantly, the kind that might open the gates of Sovngarde. He was once a skilled archer, though his sight has taken a turn for the worse in his later years meaning he is unable to be as accurate as he once was. His loss of accuracy is made up for by his Companion-training with the axe and shield. Despite his small size, he fights as well as any other of that order. A seeker of knowledge and thrills, this young Redguard woman has found herself embroiled in many plots, tales and adventures. From the dark roots of her now severed affiliation with the Worm Cult, to the light of Aetherius and the Aurbis beyond as shown to her by her Mentor, she strives for a deeper understanding of the world. Behind her lies a path wrought with both wonder and horror alike, as her journey to the present has been anything but easy. Even now, she is hunted, both by her past and the people from it. Having learned to look to the future, rather than the past, Ashayi is ever moving forwards. With her intuitive ability to sense magic and read the flow of Aetherius' life-blood, she arms herself with a variety of skills. Wielding staff and flame alike, she sought out the disturbance of magic that rippled along the veins of Nirn, only to find herself at the ruins of Dovecourt Castle. A path led her then to Anvil, onwards to The Circle and its secrets. A preserver of magic in all its forms, Ashayi has vowed to see the waters of Avathol flow once more. Little is known of the events surrounding the history of the tricky Mer prior to his enlistment with the Rangers of The Gracewood, under service to the now disgraced House Carleon. A checkered past of amateur mercenary contracts leaves little glory for boasting. Often sarcastic in nature with aggressive tendencies, Tadéll does not allow for many to become close to him. Usually seen skulking in the background or lingering in hidden nooks and crannies, he rarely engages others in social interaction. 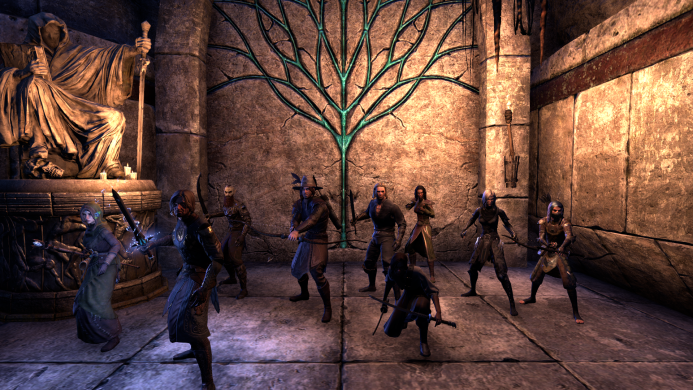 Yet despite his many shortcomings, the Bosmer's talents with a bow and aptitude for moving unseen in even the busiest of crowds lends well to the cause of Avathol. The Gold Coast. A hive like no other, where corruption and chivalry contest in an independent conflict for dominance. 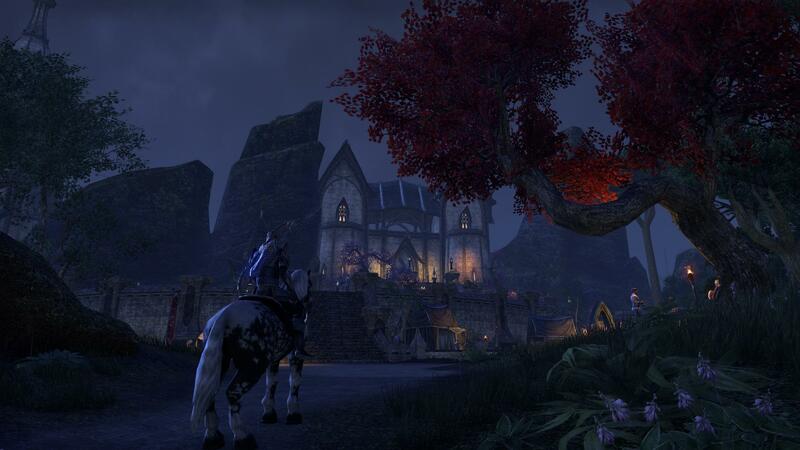 Vying for recognition among the greater circles of Tamriel’s enriched society, the free cities of Anvil and Kvatch provide open sanctuary to those fleeing from misfortune and bloodshed. This is the first location for the Circle’s forthcoming tales of adventure, and intrigue. Whilst Gilduin Carleon leads the hunt to reforge the Relic of Avathol from its Keystone and Vessel, the Circle must continue in its arduous efforts to exist as its own entity, should the Quest for Avathol fail at any point. Smugglers run rampant upon the shores of this region, whilst bandits and outlaws viciously sever the ties between the denizens of innocence, and the brutal traditionalists who wish to see order restored. The Empire continues to stride forth into these free lands, engaging those who rebel in small incursions, discreet from the watchful eyes of the Three Banners. With new arrivals joining the Circle in every waking moment, and daggers drawing to meet the rise of a new faction, those present must discover their own intentions and execute their missions to outweigh the tethers of control that latch to their humble beginnings. From across the sea, the Circle have left the cryptic shores of the Gold Coast, to begin their fateful endeavour to reach Lady Aeowyn within the fantastical region of Auridon. With the terrifying revelations unearthed, regarding the true nature of the Scions, led by Cralvus Malcrone, the threads of despair have begun to tighten the noose. Leaving the comforts of the Perennial Manor behind after a daring escape to Anvil, a rugged future lies in wait for the freshly-forged followers of the Circle's noble cause. Between the pristine landscapes, verdant hills and sprawling jungles, the region of Greenshade is both welcoming and wrathful. The Bosmeri villages shall provide shelter to those of a similar ilk, but the creatures of the night continue to prowl upon the wayward few. There will be little time to adapt to the setting, and hopefully, it may be the case that they can bypass the poisonous possibility of having to navigate through the labyrinth. But nothing is certain in this land. Grahtwood. 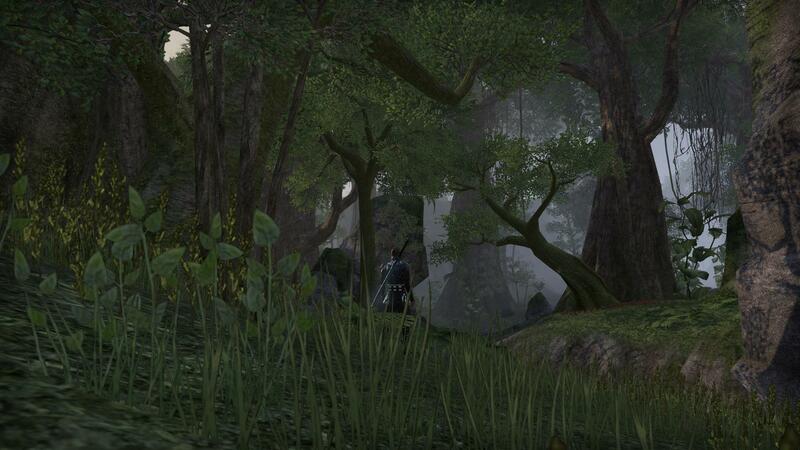 The true homeland of the Bosmer is reflective of both their culture, and their physiology. Barbaric, brutal but benevolent, this landscape is unlike anything that they have encountered so far. A verdant labyrinth of graht-oaks houses the civilised and the tribal in equal measure. Bone markers linger on ancient trails, as ravenous predators descend at both dawn and dusk to prey on the weary. This is not a place for the faint-hearted, its wilderness seeking to oppress those who wander beyond its glorious sanctuaries. Some consider this to be the heartland of the Aldmeri Dominion, but others deem it to be an audacious arena, for every nook and cranny contains a vicious test. Yet, its occupants are not the only foes to contest with, as the crushing humidity and manipulative weather twist and lacerate to repel even the strongest warrior. After all, no soul carries a weapon potent enough to cleave through the will of nature itself. They may have fought against the perils of the darkness, but how will the Circle fare against the resolve of the natural world, in a place that few have traversed beforehand? Auridon. The epitome of high society, with its glistening towers and gleaming shores. Fine wines and elaborate agreements cannot hide such hierarchy in isolation, as the rigid maxims of tradition and heritage prey on inferior beings. Despite efforts to rectify the Aldmeri superiority within the archipelago, Queen Ayrenn’s attempts have often fallen upon deaf ears, especially in reputable, noble circles. Yet for all of their intrigue, both ignorance and arrogance continue to be the foils of those in power, as conflict itself seeks to shatter the peace from within.